Promoted: Deal of the day sales bonanza in the last week of the Sevenoaks Sale | What Hi-Fi? There are some amazing sound and vision bargains to be had at Sevenoaks Sound and Vision – a deal a day… but don’t dally. Ah, January. The tree is down, the decorations are back in the loft, the leftover turkey has finally been eaten and that new gym membership has already faded into a sweaty, ill-advised memory. There’s nothing to do but sit at home and wait for spring – so it makes perfect sense to make sure you’re kitted out with some top-drawer equipment to keep you entertained. Sevenoaks Sound and Vision is here to help in the last week of its January Sale, featuring a daily deal for kit including hi-fi, TV, home cinema, headphones, speakers and soundbars. 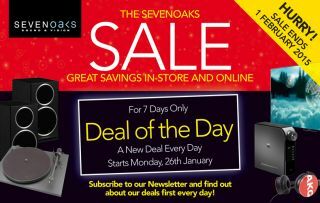 The sale runs until midnight on Sunday 1st February – but stocks will be limited, so make sure you sign up for the Sevenoaks newsletter to get the heads-up on each day’s new offer. Sign up for the Sevenoaks newsletter here for more details, and to keep updated with the latest offers and further reductions. The sale runs until midnight on Sunday 1st February. And click here for even more offers.